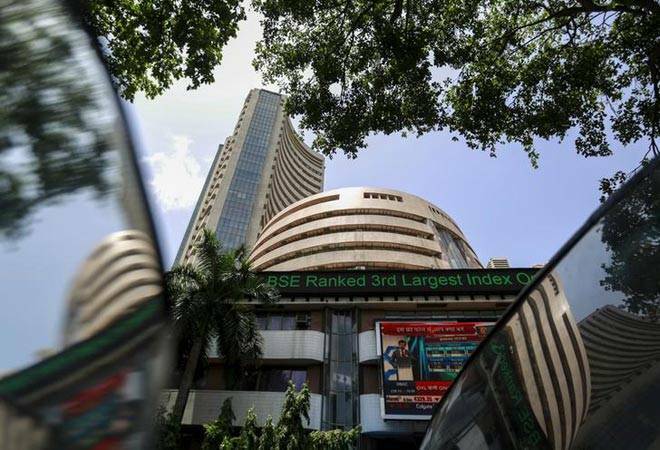 The benchmark BSE Sensex dropped 61 points and settled below the 35,000 mark on Monday, tracking weak Asian stocks amid uncertainty around the China-US trade war and fall in rupee. The gauge had rallied almost 580 points on Friday. The broader NSE Nifty, after slipping below the 10,500-mark to hit a low of 10,477, finally concluded 29 points, or 0.27 per cent, down at 10,524. "Rupee weakened on account of crunch in domestic liquidity while gradual decline in yield may ease the concern. Investors' were bit conservative in the holiday shortened week due to uncertainty regarding US china trade deal and Fed policy," they added. In the Sensex pack, IndusInd Bank was the biggest loser, plunging by 3.29 per cent, followed by NTPC 2.72 per cent. Other laggards included PowerGrid falling 2.18 per cent, ONGC 1.59 per cent, Hero MotoCorp 1.54 per cent, HDFC 1.46 per cent, Vedanta 1.44 per cent, Adani Ports 1.35 per cent, ICICI Bank 1.27 per cent, TCS 1.04 per cent, ITC 0.97 per cent, M&M 0.89 per cent, L&T 0.81 per cent, Bharti Airtel 0.68 per cent, Kotak Bank 0.34 per cent, Asian Paints 0.32 per cent and Tata Motors 0.18 per cent. In contrast, SBI emerged as the top gainer by surging 3.45 per cent after the country's largest lender on Monday reported a net profit of Rs 576.46 crore in the second quarter ended September 30. Axis Bank too rose 2.35 per cent after the private-lender on Friday reported a 83 per cent jump in its net profit at Rs 790 crore for the quarter ending September on the back of healthily growth in core income and a decline in provisions for bad loans. Wipro, RIL, Bajaj Auto, Coal India, Tata Steel, Yes Bank, Maruti Suzuki, HDFC Bank, HUL, Sun Pharma and Infosys too ended higher by up to 1.52 per cent. Among sectoral indices, the BSE power index emerged as the worst performer by falling 1.59 per cent, followed by oil & gas index shedding 1.42 per cent, healthcare 0.64 per cent, infrastructure 0.60 per cent, consumer durables 0.51 per cent, capital goods 0.40 per cent, auto 0.33 per cent, PSU 0.31 per cent, FMCG 0.31 per cent and teck 0.08 per cent. While realty index rose by 1.55 per cent, metal 0.15 per cent and bankex 0.12 per cent. Selling pressure also dragged down the mid-cap and small-cap indices by 0.68 per cent and 0.42 per cent, respectively. Elsewhere in Asia, Hong Kong's Hang Seng fell 2.08 per cent, while Japan's Nikkei was down by 1.55 per cent. South Korea's KOSPI index fell 0.91 per cent, while Taiwan index down 0.17 per cent. Shanghai Composite Index shed 0.41 per cent even as President Xi Jinping promised to lower import tariffs and continue to broaden markets access. Taiwan lost 0.89 per cent. In the eurozone, Paris CAC 40 fell 0.12 per cent, Frankfurt's DAX lost 0l.19 per cent, while London's FTSE shed 0.10 per cent in their early sessions.